Our five interns began work yesterday. 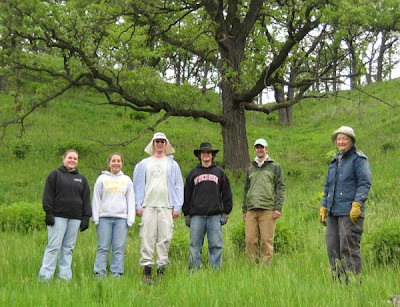 The intern program, administered by Madison Audubon Society, is an important part of our summer restoration work. This is the sixth year Pleasant Valley Conservancy has participated. Four of the students are from U.W. Madison and the fifth from U.W. Stevens Point. The first day was mostly orientation, including an extended field trip. In the afternoon, they tackled a number of honeysuckles that had escaped our earlier work. These were all in flower and we didn't want them setting seed! This time of year, the best procedure is to cut all the woody stems with a hand loppers and treat all the cut stems with glyphosate. 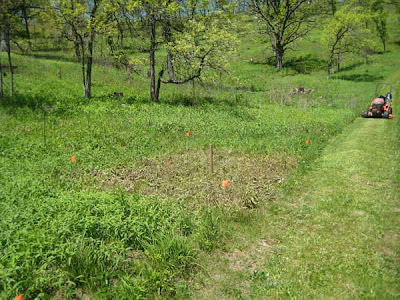 The interns managed to "clean" out a fairly large area at the edge of the Crane Prairie. During the 70 years since that air photo was taken, this site gradually filled in with primarily undesirable trees and brush. Last winter (December 2007-March 2008) we cleared this whole basin, and most of the cut trees have been removed for fire wood. Also, a neighbor moved in a small saw mill and has turned the largest black walnuts into lumber. We decided that we would wait to see what came up spontaneously before we started serious restoration. In an earlier post I mentioned the large numbers of shooting stars now in flower. In addition to the good plants, there are many bad plants, including scattered brambles, honeysuckle, and buckthorn. Past experience has shown that once an area has been opened up and sunlight is available, these invaders will thrive. Therefore we decided to eradication them now, while they are small. For this purpose, we are spraying all of the resprouts and small plants with Garlon 3A, an herbicide effective against woody species. A crew of workers is now passing through this whole unit and spraying all undesirables. In addition to the shrubs, this includes Canada goldenrod and Canada thistle, two invasive forbs. The idea here is that a small amount of expense now will save a huge amount of expense later. I wish we had taken this approach with all of the other areas we cleared! Garlic mustard is by now famous in southern Wisconsin as our worst invasive plant. People everywhere are working to eradicate it. Roadsides are major eradication targets because this is the most common mode of transmission from one place to another. At Pleasant Valley Conservancy, we have been at the forefront of efforts to remove it from roads in the Town of Vermont. Fortunately, there are only a few serious patches, and the Town Board has been very receptive to these efforts, even providing some money to get a contractor involved. Imagine my dismay when Kathie and I took a drive on several roads in the Towns of Arena and Ridgefield, Iowa County, passing the worst roadside infestations of garlic mustard we have ever seen. Miles and miles of flowering garlic mustard plants that had taken over and would be making seeds soon. This area, along Ray Hollow and Knights Hollow Roads (and probably others), is a disaster. All native plants have been wiped out. If these roadsides are mowed seeds will be transported far and wide. The situation is so bad in these areas that herbicide spraying is the only option. Garlic mustard is very sensitive to the common weed killer 2,4-D, which has the advantage that it is only active against broad-leafed plants. Grasses are not affected. However, spraying the named roadsides is far beyond a hand-held or backpack sprayer. Gallons of spray are going to be needed, from a boom sprayer. The Invasive Plants Association of Wisconsin has a very useful web site with important information on the control (among others) of garlic mustard. I have added links to their pages on community weed control and on the use of herbicides. 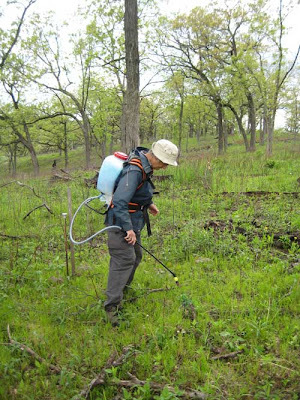 Roadside spraying with herbicides received a "bad press" about 35 years ago. The objection then was that spraying would wipe out "good" native vegetation. This may have been true, but when major infestations of such bad plants as garlic mustard are allowed to develop, there is no other option. Citizen input is needed, not only in Iowa County, but wherever major infestations occur. The Wisconsin Department of Transportation manages weed control on state and federal highways and uses herbicides judiciously. However, they do not work on county or town roads. Woodland sunflowers (Helianthus spp.) are showy plants but highly invasive. Although they are found mainly along wood edges, they often remain after woods are cleared of invasive shrubs and trees. 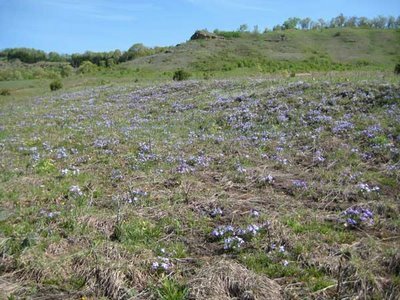 They not only continue to thrive, but are able to spread into native prairies. Last year I observed two patches of woodland sunflower in the Pocket Prairie which had spread by underground runners from a nearby savanna area. Although the flowers may be nice, too much of a good thing is bad. Woodland sunflowers are definitely plants out of place in prairies and savannas and are therefore classified as "invasives". Once they get started in an area they crowd out all other native plants, thus greatly reducing species diversity. I have been unsuccessful in eliminating these plants by mowing, a technique that often works for Canada goldenrod. They quickly recover and come back the following year with undiminished vigor. Hand pulling may work, although it is difficult to remove all of the underground root stock. The best bet would seem to be a broad-leaf herbicide. I did some preliminary experiments last year with clopyralid (Transline), an herbicide very effective against members of the aster family. The patches were killed, but I was not sure if the underground root stock was eliminated. This year I am repeating the clopyralid work and adding another broad-leaf herbicide, triclopyr (Garlon 3A). The two photos below show the response just a few days after spraying. Garlon (upper photo) and Transline (lower photo). The plants are obviously sensitive. The plots are permanently marked so that I can return to them next year. Today Kathie and I made a brief visit to the bird banding station near Picnic Point in UW-Madison's Lakeshore Nature Preserve. This fascinating program has been operating for several years now, and has brought in many visitors as well as volunteer bird banders. The person behind the program is Mara Macdonald, a licensed bird bander. Banding of birds in the U.S. falls under the Migratory Bird Treaty Act and requires a federal banding permit. Only official federal bands may be legally placed on birds that are released to the wild within the United States. Bird banding is the major research tool for the study of bird migration, and over the 100 years since bird banding began, millions of birds have been banded. The bird banding station at the Preserve is near the UW Biocore Prairie. Thin mesh nets called mist nets are installed across various areas. Birds fly into the nets and are trapped. The bander gently removes the bird from the nest, places it temporarily in a paper bag, and brings it to the bird banding station. There data are recorded on the species, weight, size, color markings, and other characteristics. 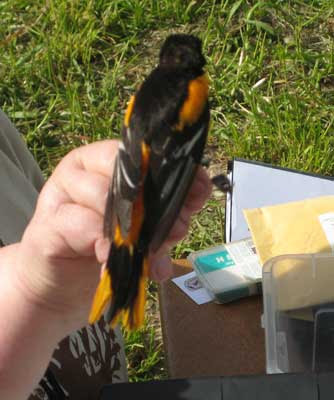 A tiny numbered band is fastened to a leg and the bird is then released. Banding has no effect on the behavior of the bird. 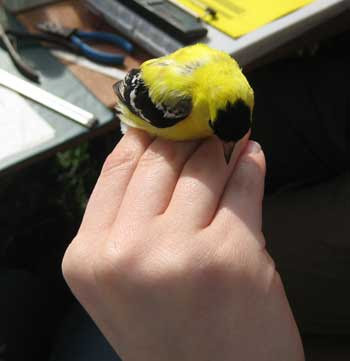 The data on each bird are transcribed on the computer and uploaded to the web site of the Patuxent Wildlife Research Center Bird Banding Laboratory of the USGS (Department of Interior). A large amount of important bird research has arisen from the federal bird banding program. The bird banding station at Picnic Point is operated every Saturday morning from early spring until late fall. 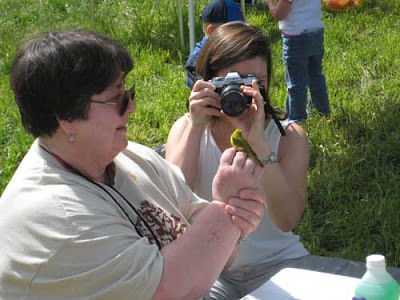 Visitors are welcome and are able to watch the bird banding work and obtain close views of a variety of bird species. 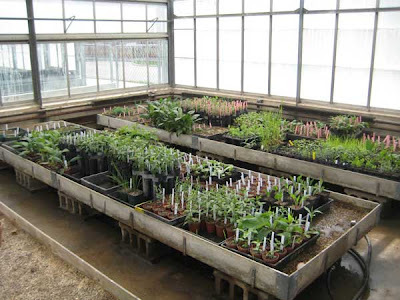 I have mentioned in previous posts that we have been raising prairie and savanna plants in the greenhouse. We collected the seeds ourselves, and did some germination tests to assess their quality. Some of them were quite good, others only fair, and a few species did not germinate at all. We started them in the greenhouse in trays, moved them to pots, and now have them hardening in cold frames. In preparation for transplanting next week, we did an inventory. We have over 300 separate plants, from 26 different species. It will take three of us several days to plant all these. And then we have to keep them watered all summer. Since the species we are growing are difficult to get started from seed, it is worth it to go to all this work. Hopefully we will get favorable summer weather, and good survival rates. We had about 70% survival over the winter of those we transplanted in 2006. This seems like reasonable success rate. For the past two weeks we have been carrying out a big push to control brambles in our savannas. The successful burns we had about a month ago top-killed most of the bramble canes and they are now resprouting from the base. A perfect time to spray, because they are relatively small, which means we don't need to use much herbicide. Also, we can avoid most of the "good" plants nearby. The new shoots are often right next to the old cane (as in the photo below), but not always. Because of the extensive underground root system of the brambles, new shoots also arise at other spots. We are dealing here with two major bramble species, black raspberry and red raspberry. The latter is the most difficult, because it forms dense clones of short, closely growing stems. 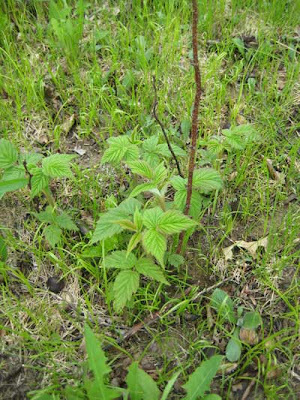 Black raspberry, on the other hand, has long arching stems which tip-root, making a traverse of the area difficult. We also have the occasional blackberry and dewberry patch, but these are easier to deal with. The photo below shows a typical pose of the bramble worker. You have to keep your eyes on the ground, so you don't get much chance to enjoy the scenery. However, this is a quiet activity, so you can really enjoy the birds (which are really vocal this time of year!). We have been spraying every day for the past two weeks, with personnel varying from day to day. Tuesday May 20 we had six people, four paid and two volunteers. I have found it very advisable to wear thick, bramble-proof pants for this work. You have to wade right into the middle of these patches to get every plant. 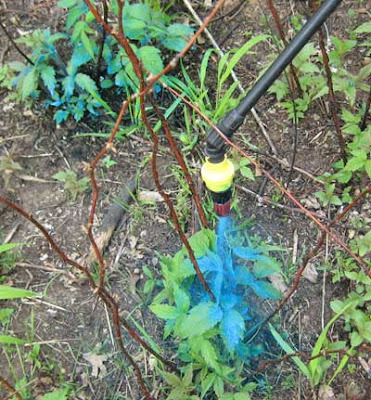 We add blue dye to our spray solution in order to keep track of where we have already sprayed. This is an invaluable tool . The weather has been great for spraying, although we really need some rain. 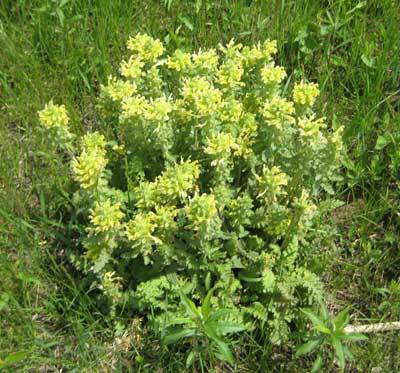 This is a great year for wood betony (Pedicularis canadensis). At Pleasant Valley Conservancy we have seen more this year than we ever have. Most of it was planted, but we also have it in a couple of remnants. However, where wood betony is really displaying is Black Earth Rettenmund Prairie, another State Natural Area that Kathie and I manage. The hillside is almost solid color; more than we have ever seen. Wood betony is an interesting plant because it grows semiparasitically on grasses. It has tiny specialized rootlets that are able to penetrate the roots of other plants and get part of their nutrition that way. 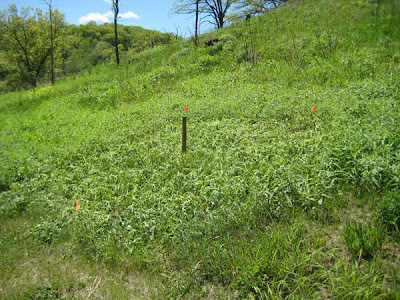 If you see large patches of wood betony, there are often grass-free zones around them. This can be seen nicely now at Black Earth Rettenmund, especially in the small planted prairie at the entrance to the preserve. The large patches there seem to live in their own special spheres, with very few plants around. At present, Black Earth Rettenmund is worth a visit, even a special trip. You won't see a better prairie right now! Today Kathie and I attended an event at the Nature Conservancy's Spring Green Preserve, to recognize our contribution to a new acquisition and to see the preserve in its early spring glory. Our donation to the Prairie Enthusiasts of land and a conservation easement from Pleasant Valley Conservancy helped to trigger a complicated land acquisition procedure involving the State Stewardship Fund, which made it possible for TNC to purchase a critical parcel at its Spring Green Preserve. Our recognition was part of a brief ceremony before a morning field trip to the preserve. Spring Green Preserve is an extensive sand prairie north of the Wisconsin River. The steep south-facing ridge turns into a veritable desert in mid-summer, creating a unique habitat. It has in profusion a number of plant and animal species that are seen rarely at other places. The Nature Conservancy now owns over 1000 acres here, and has done great work to preserve and restore it. 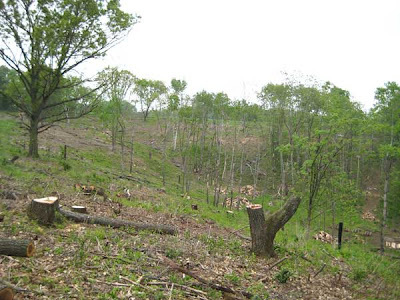 The new parcel acquired partly as a result of our donation was a critical piece that brought the preserve land all the way to Wisconsin Highway 23, thus providing excellent access for management activities on the west end of the preserve. 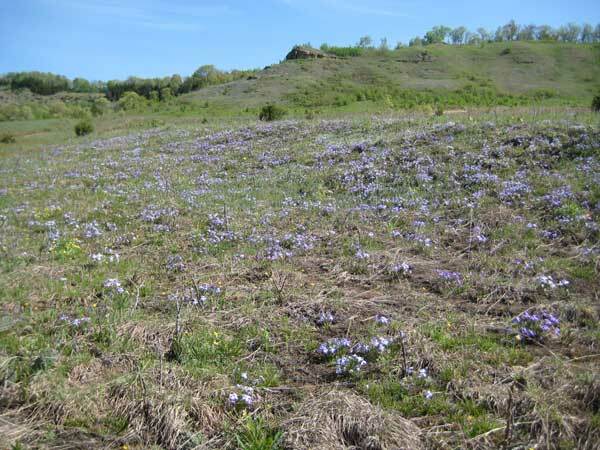 The blue haze we saw across the preserve was due to thousands of bird's foot violet plants in full bloom. The 0.2 acre patch of this species we have at Pleasant Valley is only a tiny speck alongside the Spring Green profusions. The trail we walked on went right through the middle of the violets. Quite a show! Bird's foot violet (Viola pedata) is one of two "prairie" violets that are found in Wisconsin dry mesic prairies. 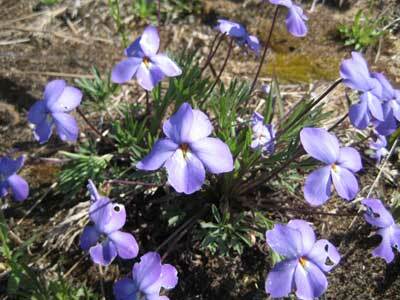 The other is prairie violet (Viola pedatifida). Spring Green has both, but pedata predominates. Superficially, they are alike, but pedata is the one that is generally found in large patches. Another species in bloom at Spring Green was dwarf false dandelion, Krigia virginiana. 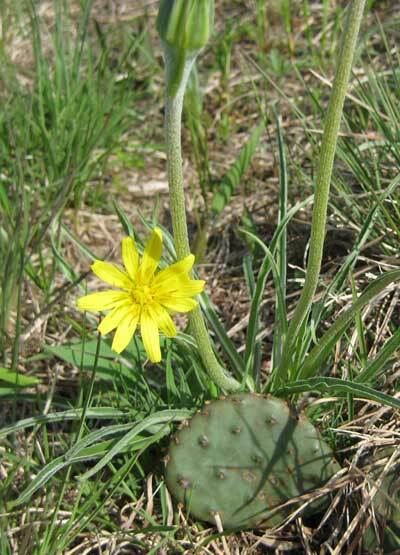 This is also a plant of dry sand prairies, and is locally abundant in southwestern Wisconsin. 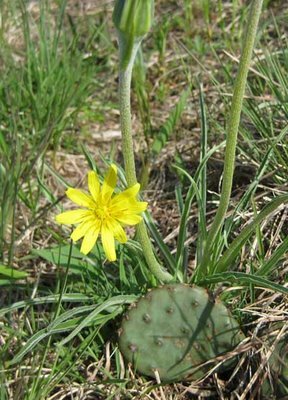 The cactus shown in the photo is another species, also characteristic of sand prairies. This is the time of year to see and enjoy birds. Recently, I flushed a pair of sandhill cranes who were foraging on Toby's Prairie, our dry mesic planted prairie that is fairly remote from the wetland the cranes usually inhabit. When they spotted me they took off with their lumbering flight and soared about 30 feet over my head. A fine sight! The next day I flushed a turkey hen from the White Oak Savanna. I didn't see a sign of a nest, but the day before Heisley had flushed one off the nest in Unit 11D. Plenty of eggs in that nest! "Our" red-headed woodpeckers are quite active these days. We see or hear them almost every day. Yesterday Kathie and I saw a pair who were probably nesting in a clump birch among the bur oaks on the savanna. While I was watching the putative nest I saw a scarlet tanager drop into a small oak nearby. Colorful! This week we are spraying bramble resprouts with Garlon. The brambles are those that were top-killed in our prescribed burns of April. They are now growing, but remain small, so that we can confine the spray to just the bramble rosettes. Susan, Heisley, Kathie, and I have all been involved here, and next week we hope to have a couple of people from our contractor, Michler & Brown. This is a time consuming job, but gives us a chance to see all of our savannas at an early stage of growth. Lots of good things coming! Although our shoulders are sore, we are enjoying the traverses through the Conservancy.